In a non-academic setting, a proofreader is the final check before something is made public. Elementary V Watson will check the work of the author, editor and typesetter to ensure that everything is consistent and ready to go! A proofreader will check page numbers and compare them with the table of contents to ensure that everything is consistent and accurate. That includes spelling and hyphenation, grammar and punctuation. A proofreader will also check graphs, illustrations and tables to ensure that the text and labels correspond correctly. As your proofreader, Elementary V Watson will draw your attention to inconsistencies, eliminate inelegant or confusing words, identify if something seems out of place or would sit more logically somewhere else, therefore ensuring that your work is not only accurate but is also in a logical order. Having proofread for numerous academic clients, from undergraduates to PhD students, Elementary V Watson will point out discrepancies in style, typography and layout. Please note that proofreading academic texts will not involve changing the content. If your school or college has provided you with a style guide, it is important to supply a copy to ensure that your work adheres to it. Many academic institutions will deduct marks for the incorrect use of referencing styles. Don’t get caught using Harvard when you should have used Chicago! Many people choose to have relatives or friends proofread their work however it takes more skill than you might imagine to be a good proofreader. Not only do you need a tremendous eye for detail, you must have an extensive vocabulary, an ability to express yourself tactfully and succinctly as well as good general knowledge. 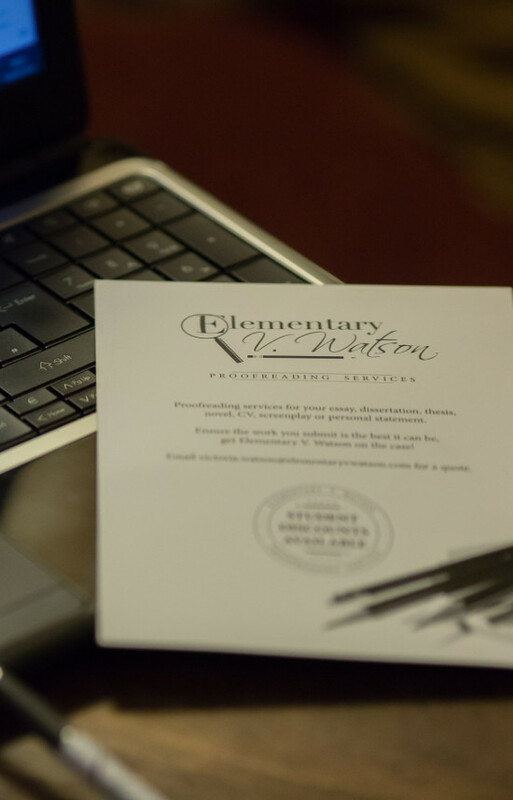 Elementary V Watson not only provides you with a reliable service but also delivers constructive feedback.